Golden Buds black tea has a beautiful golden color when dry. This is because of the rich antioxidants and low level of chlorophyll in the early spring tea buds. Dian Hong Jin Ya, also known as Golden Buds, has a rich aroma. Some people say that this Yunnan black tea has an aroma that resembles cacao. The flavor is smooth with a delicate sweetness that fills the entire palate. Golden Buds is truly a remarkable tea. Our Dian Hong Jin Ya comes from the region of Bai Ying, in Yunnan province where it is picked when the year’s first tea buds begin to grow in late March or early April. 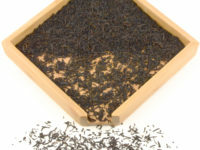 Most black teas are made from leaves that are harvested later in the year, and when oxidized and dried, they appear black in color. Young tea buds, on the other hand, are a beautiful golden color after processing. This is due to the rich antioxidants and lower amount of chlorophyll contained in the young growth. The fine fuzz on each bud is a testament to the tea maker’s skillful handling of the leaves. Yunnan Province first produced black tea in 1939. The Chinese government sought to move the crop from Japanese occupied lands to the east. Two great tea makers, Feng Shao Qiu and Fan He Jun, explored Yunnan. They were searching for a place to create a production base for commercial black tea. They found the Feng Qing County in southwest Yunnan. 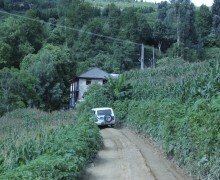 It was an ideal place to begin producing quality tea due the richness of the soil in this area. There were also already a diverse bounty of tea plants growing here, some of them very old. Today there still stands a famously old tea tree in Feng Qing County, called “Xiang Zhu Qing Cha Zu.” It is the largest and thickest tea tree ever discovered. The tree exists under national protection because of its botanical significance. This tea tree is estimated to be 3200 years old. The diameter of the trunk of 1.84 meters thick. That’s 6.04 feet! The Feng Qing Tea Company first produced Jin Ya in 1958. Instead of using 1 bud to 2-3 leaves, they started picking only tea buds. Yunnan Province was the first place to make black tea from only tea buds. If left on the tea bush, healthy tea buds will open five or six tea leaves. Tea masters must be quite skilled to check which tea buds have these five or six layers of leaves packed inside. The tea master must control the oxidation process through every layer of the bud. Only a very skilled tea master can do this. Black tea that is too oxidized will be sour, and if the tea is under oxidized, then the tea will be heavy and tannic. Our Dian Hong Jin Ya uses fresh leaves from the mountain that surrounds Feng Qing County and Yun County. The buds are harvested at the end of March. The tea master will spread a thin and even layer of fresh picked tea buds on a bamboo tray to breathe for 3-5 hours. They are then placed in a wind tunnel made from woven wood or bamboo. Fans will blow air through the tunnel to wither the leaves for about 5-6 hours. The tea master will then fry the leaves by hand to remove about half of their water content. The tea is then wrapped in fabric and placed in wooden boxes covered with a thick piece of fabric to keep the buds warm. This will oxidize the tea in a natural fashion. The tea master must check the tea buds often. He has to mix the tea together to give even heat to the buds. A tea master manually judges when to arrest the oxidation process. He does this by squeezing and smelling the tea, judging the tea by his nose and hands. This is an extremely key step of the process and must be carefully controlled in order to develop the tea’s aroma and make sure the taste is sweet, smooth and without any grassy flavor of unoxidized tea leaves. No chemical fertilizers, pesticides, or herbicides used in the production of this tea. Click here to read more about our promise to fair trade and the environment. Driving to countryside tea factory in Fengqing County, Yunnan Province. Tractors replaced horses in the countryside of Yunnan Province. Bamboo and wood made factory floors with withering fresh leaves. Bamboo and wood made factory floors for withering fresh leaves. Roasting machine to turn wet leaves dry. A tea kneading machine, the bottom is made of wood which rubs the leaves tightly together. Golden Buds' hometown, Feng Qing County, is the home of the largest cultivated tea tree. This tea is known as Xiang Zhu Qing Da Cha Shu. It is estimated by the government to be at least 3200 years old.